The Power Of A Deep-Tissue Massage, Right In Your Own Home…And For A Fraction Of The Cost! If you’re an active person, then you’ve probably searched for that perfect way to heal your muscles and aid with workout recovery…right? But whether your hobby is Crossfit, yoga, sports, martial arts or lifting weights, there’s no shortage of “specialists” out there who charge an arm and a leg to heal a back and a neck. That’s why the Omega 3-Speed Vibrating Foam Roller is the perfect solution for active people who want their healing to be not only powerfully effective…but convenient and affordable as well. Just imagine it…next time you’re sore and find yourself wanting a massage, you won’t have to search around for the best therapist. You won’t have to waste your time driving to the office and back, and you won’t have to spend all that cash on each and every session. 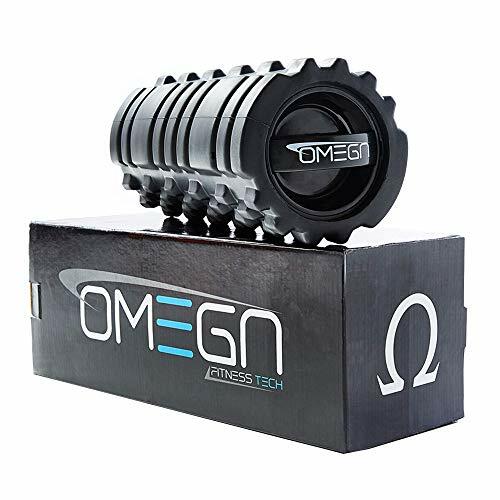 The Omega roller includes nubs of varying intensity, including a smooth area as well. Whatever your muscles need, this Foam Roller delivers! It measures just 14 x 33 centimeters, so it’s easy to store and take with you when traveling. And best of all, your satisfaction is guaranteed. If you aren’t happy with the results in 30 days, simply let us know and we’ll refund every penny of your purchase. There’s no risk at all, and a lifetime of comfort and relief to gain! So whether you want to improve your flexibility, recover from a workout, or feel like you’ve just had a luxurious deep-tissue massage…do yourself a favor and simply click “Add To Cart” to add this wonderful tool to your routine today!